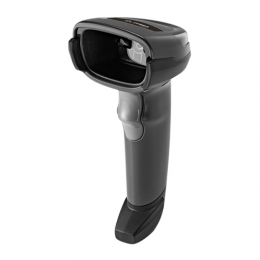 The affordable all-purpose barcode scanner Zebra DS2208 reads both 1D and 2D barcodes in a matter of seconds - from classic paper and plastic labels to smartphone displays. It captures customer cards, promotion cards, vouchers and much more for simple payment settlement, also directly from a customers smartphone - optimal for usage in retail and hospitality, even during peak times. The DS2208 automatically recognizes handheld and presentation operation through the simple placing in or removal from the presentation stand. The multi-functional area imager is ready to go when it leaves the factory, thanks to comprehensive pre-configurations - just unpack it and get started Once connected, the DS2208 automatically recognizes the connection cable either USB, RS232, KBW or IBM via Auto Host Detect, eliminating the need for further adjustments. Thanks to Zebras free-of-charge remote software SMS Scanner Management Service, you manage and configure the DS2208 and many other models worldwide from a PC, smartphone or tablet. Zebra makes switching from 1D to 2D easy for you, with full backwards compatibility to all existing connection cables of the widely used Zebra LS2208. 2D barcodes have made their way to your Point of Sale, appearing on everything from the items your customers are purchasing to printed and electronic coupons and loyalty cards. Your 1D scanner can’t capture the new 2D codes, leading to exceptions that slow down the check-out process and frustrate customers at that key last personal touchpoint in your store. But with the DS2200 Series, you can scan it all. You get an affordable 1D/2D imager that doesn’t compromise performance or features for price. Your workers get best-in-class first-time, every-time scanning with point-and-shoot simplicity. You get an imager that couldn’t be easier to deploy and manage. And you can choose the model that best fits your POS needs — the corded DS2208 or the cordless DS2278. * The DS2200 Series — the affordability your budget demands, with the deployment, ease of use and management simplicity your business requires. Since the default settings are optimized for the majority of scanning applications, you can use the DS2200 Series imager the moment you take it out of the box — no configuration required. Just plug the DS2200 Series into your Point of Sale (POS) and the auto-host detect cables will automatically identify the interface and connect the imager, simplifying and reducing setup time. DS2200 Series right from the tablet. With support for 97 international keyboards, the DS2200 Series is easy to deploy all around the world.